Before I start, a thanks to @fatherjack for being the first person to request a topic from the backlog. If any of you want more of the same, just shout! Up to a certain point in my career, my success was defined largely due to my ability to find creative and often tangential solutions to difficult problems. For anyone that’s completed a Belbin assessment in the past, I’m mostly classified as a “plant“. My major strength has changed very little in 15 years although my complementary strengths and views have all shifted a lot (I might discuss this in more depth another time). With this strength in mind, I found that when working with others I often jumped past a lot of the detail and rapidly offered solutions and alternatives. The sheer volume of options I can provide means many did stick and work. However, using this approach risked those seeking support or assistance becoming dependent on my problem-solving rather than developing knowledge and learning to solve problems themselves. When I became responsible for other staff I recognised that many of the strengths that got me to that point were not appropriate to leading or coaching others. Having led a number of teams, managed a full spectrum of technical staff, implemented organizational change programs and most recently being responsible for a company-wide community of practitioners, my coaching skills have become more and more critical to my role. Coaching Dojos have helped significantly – using coaching tools repeatedly as a deliberate practice but there’s still something not quite right. I still have those problem-solving skills going to waste, there must be something I can do with them. So here’s the thing. Just because you’re coaching doesn’t mean you should only ask questions, it doesn’t mean you shouldn’t direct or tell and it doesn’t mean you shouldn’t get to have the fun of solving problems for (or with) others. You just need to understand more clearly when it’s appropriate to do so and when it’s not. Learn to spot when you’re “telling” when you should be “coaching” and vice-versa. This can be really tricky to achieve when you have all the answers and ideas. I can’t cover the full depth of the model in a blog but here’s the basic conceptual framework – this should be plenty to help you recognise when to coach and when to “tell”. There’s a direct correlation between the style of leadership you (as a coach/leader/mentor/manager/team member/person) use and the development level of the coachee/seeker/mentee/staff/team member/person/team. Important note – this applies just as much when leading or coaching teams, not just individuals. 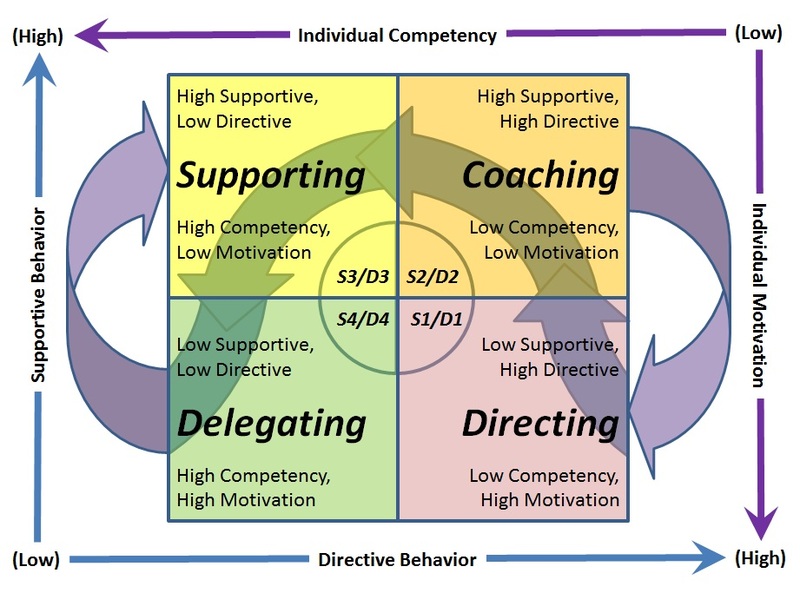 We model this as four “Development” levels (D1-D4) and 4 corresponding “Styles” (S1-S4) This might seem a bit jargon-y but putting this into practice really does work (see the diagram below). The suggested style to use is based on a composite of the motivation of the individual and their competency level. As an analogy, consider learning to drive a car. Most new drivers are really keen, think this is going to be easy and can’t wait to be out under their own steam (Level D1). As an instructor, you need to let this play out, give them the space to try and succeed (or more often fail) but you do need to be quite prescriptive in what they do for their own safety (and that of others) (Style S1). When things get hard and motivation wanes (Level D2), you continue to tell them what to do but in a coaching style (S2). As competency develops, the trainee becomes more competent (D3) and your style will need to follow. Eventually they will (hopefully) become self-sufficient (D4). Our regular trainer actually talks us through a lot more than the textbook model. The diagram below is my interpretation of the model with the additional tips we’ve learned. There’s a few really important points that help us use this as a thinking tool. The model applies to each specific task. If a person has never performed that specific task before, re-assess their development level. Some complementary skills may apply but don’t assume competence in one area translates directly to the task at hand. Watch for transitions in motivation as a guide to levels of support to offer. When individual motivation is low, the coach/leader must be more supportive – more guiding and questioning. When motivation is high, less support is needed. When individual competency in the specific task is low, the coach/leader should be making the decisions on the course of action (even if leading through questioning). When individual competency is high, the coachee makes the decisions but may still occasionally want to validate these with the coach. A mismatch between leadership style and development level can be harmful. The further apart the difference, the more dissonant the leadership style will be. There are a couple of important extensions to the model that need consideration. In many work environments, there are times when a person may have high expertise in an area but not be motivated to actually work in it. Similarly, someone who reached a high level of competence in an area but is ignored may lose motivation. In these instances, they have actually regressed around the model (from D4 to D3). Your leadership style needs to change! In other situations, you may have someone with little or no motivation to work on a new task and little or no competency. Rather than starting at development level 1 (D1), you’re actually starting at D2. You need to work with the other person to build motivation and competence. At this point they either develop to “D3” or first to “D1” and then back through the cycle. Like all frameworks, this is a tool only. Use with caution. The more you understand how to use this, the better you’ll manage with it. If you’re interested, get trained properly, don’t just rely on what I’ve presented here. This entry was posted in People, Simple Tools and tagged coaching, leadership by The Captain. Bookmark the permalink. Thanks for this. I wasn’t expecting an insight into the Situational Leadership structure from the title the I picked from the backlog. Looking forward to more.! Great timing for me, I was just going through some thoughts about such thins and luckilly found this art, just by going through links on the web :) Thank you very much!